According to Eastwood’s nameless antihero, dubbed Joe in Sergio Leone’s classic, he’d never seen “a town as dead as” San Miguel which he wanders into looking first for food and something to drink as long as that something isn’t water. Of course, once he finds something to quench his thirst, his true drive for the almighty dollar returns. Shortly thereafter a scheme is put into place to play the rifle wielding residents divided into two gangs— namely, the liquor selling Rojos and the gun running Baxters – against one another by aligning himself first with one side and then another since San Miguel is no place for a man caught in the middle as the local barkeep tells him. With only days before the military is rumored to ride in and intervene in the perpetual standoff as the two sides pick off their rivals one funeral at a time, Eastwood’s pistol toting stranger aims to make as much gold off of the violent citizens as possible before, that is, the hardened and morally flexible man’s conscience gets in the way. While the Blu-ray transfer of this remarkably aged 1964 work (released in the states in ’67) leaves much to be desired as little more than a slight step up from DVD, the music of Ennio Morricone pouring out of your home theatre speakers makes it no wonder that part of the reason Leone was rumored to let his slow-moving films draw out at a snail’s pace was for the audience to relish in the delicious American western inspired Italian movie scores. 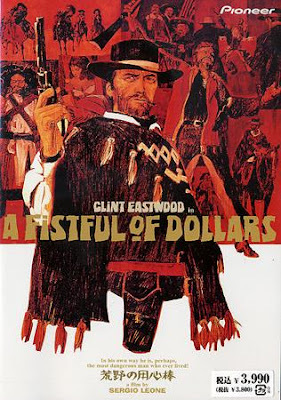 Filmed on the cheap in Spain, Dollars which is credited with officially ushering in the Spaghetti Western genre, borrows heavily from its unofficial main source of inspiration – Akira Kurosawa’s Yojimbo -- along with Carlo Goldini’s Servant of two Masters, Dashiell Hammett’s Red Harvest and nods to some of John Ford’s early western favorites. Still influential to filmmakers working today, A Fistful of Dollars helps set up the wit that would infuse its far more entertaining follow-up For a Few Dollars More along with serving as an important experimental work that helped revolutionize the field of editing and pays off at its most supreme in The Good, the Bad and the Ugly. 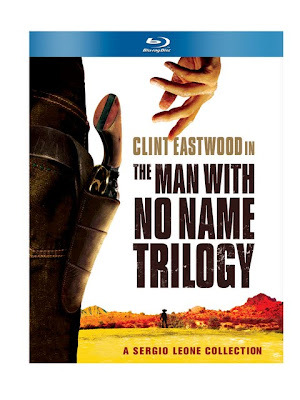 And despite the fact that most of the praise for the trilogy is saddled on The Good, few Leone sequences dazzle with as much extraordinary intensity as the pulse pounding extended progression of action from the earliest moment that Eastwood is captured by the Rojos gang up through his breakout and the film’s epic gun battle with the Baxters. 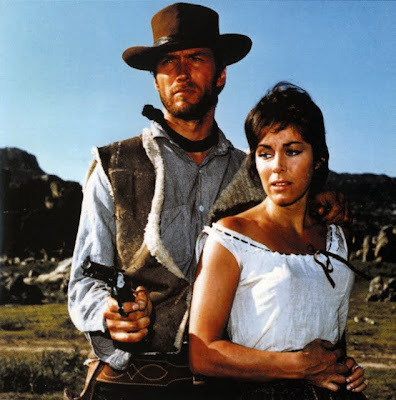 Although the only print he’d seen of his first collaboration with Sergio Leone a year earlier in A Fistful of Dollars was the Italian version since the movies wouldn’t be released in the United States for a few more years, Clint Eastwood knew based on the visual presentation alone that he would happily collaborate with the filmmaker once again in this second installment in the Dollars or Man With No Name Trilogy. An underrated masterwork that boasts a more involving and intellectually appealing plotline than the rather simple story dazzlingly told in Leone’s Yojimbo take Fistful, For a Few Dollars More is a technically superior entry on Blu-ray with a beautiful widescreen print that fills your living room with sandy desert as far as the eye can see. This time given the nickname “Manco” instead of Joe, Eastwood returns as a fortune hunting “bounty killer” eager to collect as much gold as he can – not from prospecting but instead from gunning down enough wanted villains in order to settle down and get a stretch of land he can call his own. One of the top quick-draw men in his field, Manco discovers quite a challenge in heroic civil war colonel turned bounty killer Mr. Mortimer (Lee Van Cleef) when both men find themselves gunning after the same ten grand reward for delivering the corpse of the murderous robber El Indio (Gian Maria Volante). And after the two men size each other up with Manco shooting Mortimer’s hat down the street until Van Cleef’s man in black returns fire with equally impressive precision, they realize that going after such a ruthless man together makes much more sense than doing so alone, especially after learning that El Indio has begun riding with fourteen other men while planning a bold robbery of the security heavy Bank of El Paso. 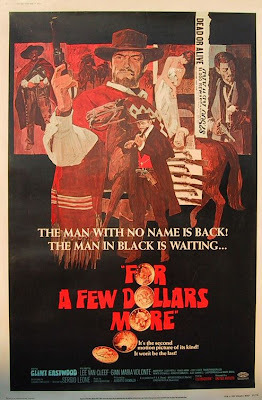 Since Mortimer has already blown his cover partly by ticking off the posse in one unforgettable scene wherein he lights a match off a bar patron, it’s up to the Man with No Name to infiltrate the gang by going undercover and aligning himself with Indio in order for him and Mortimer to begin thinning out the herd. Grossly underestimating the intelligence of the man whose face is currently adorning wanted posters all through the old west, Eastwood soon realizes that his double life is just beginning and that perhaps Mortimer may have personal reasons for wanting to see El Indio dead. By giving Eastwood another actor to play off of throughout, thereby helping to augment the chemistry and roles the men would later tackle for Leone in The Good, the Bad and the Ugly, the overly long middle Dollars work seems to hold up far more admirably than the film that started it all as a stylishly entertaining, surprisingly humorous and gun-play heavy vengeance fueled western. Arguably Sergio Leone’s most quintessential spaghetti western, The Good, the Bad and the Ugly is also widely considered to be one of the filmmaker’s greatest cinematic achievements and one that blows the other two Dollars pictures off the screen faster than Eastwood can unload his pistol in the movie’s legendary three-way shootout. 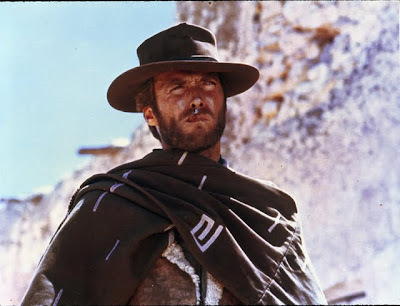 And while there’s certainly a lot to admire about the ultimate installment in The Man With No Name series, as the themes, techniques, and post-production effects he’d been utilizing in the other films finally all came together in what can be viewed as his thesis effort, one of the major drawbacks to the film as a whole is that there just isn’t enough cohesive material to keep us invested for the whopping three hour running time. 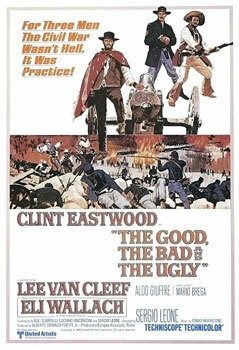 Ultimately the film follows Eastwood (the existential “good”), Lee Van Cleef’s wretched “bad” and comic relief Eli Wallach’s “ugly” as the three untrusting men who make their way to the site of buried Confederate gold during the Civil War as double crosses and shoot-outs threaten their uneasy partnership at every turn. And perhaps understandably rationalizing that he didn’t have enough with that premise to fill out an entire picture -- instead of tightening the focus of the work -- Leone pads the movie with meandering segments, adventures the trio happen to pass along the way, even going as far as to branch so far away from the western that it becomes a prison movie and later a war film on its uneven journey towards its unforgettable, legendary cemetery shootout. 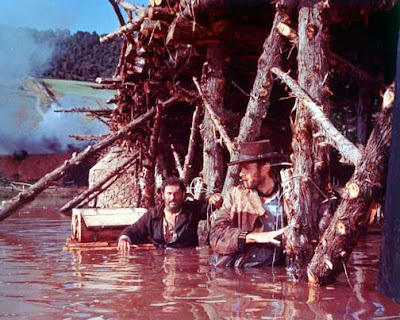 Essentially the longest music video on record where Leone lets scenes keep rolling in order to maximize Ennio Morricone’s scores which were completed before shooting even began, The Good, the Bad and the Ugly makes up for its many continuity struggles with distracting edits and takes that seem to run so long that it’s a wonder he doesn’t run out of a reel of film. Yet between the madness of it all, those patient enough to watch minutes simply go by as we listen to one of the most recognizable soundtracks in film history will appreciate the actively heightened style that forever altered the way that filmmakers build tension into the action sequences in their films from then on as Leone’s The Good, the Bad and the Ugly has since become one of the most influential western epics of all time. And despite some of the structural gaps that interfere with the success of the storyline since – aside from the film’s extremely graphic violence – as a whole Leone keeps changing his mind over whether he wants to make Treasure of the Sierra Madre or one of Howard Hawks’ more jokey male bonding westerns given the interplay with Eastwood’s “Blondie” and Eli Wallach’s Tuco, the 1966 classic is still well worth a look. Crisply transferred to Fox Blu-ray and loaded with scholarly extras, while you may require extra caffeine to make it through some of its aimlessly long stretches, you can’t beat The Good for its enviable style, scope and the amazing showcase it proved to be for not only its spirited director but his three-time lead Clint Eastwood who was poised for super-stardom after the three films’ U.S. release in 1967.